Q1.What is the difference between the trial version and the registered version of the program? The trial version and registered version are the same product, except for the limitation: Limit the output files to 3 minutes. After purchasing, you will get a registration code. Once you register the product, the free trial limitations will be removed. Q2.What shall I do, if the registration code is invalid? Step 1: Make sure you install correct version of our product in your computer. Step 2: Ensure there is no trailing blank when entering the licensed E-mail and registration code and They are all zeros in the registration code, no letter O. Step 3: Contact us ([email protected]) directly with a screenshot of the registration window for us to further analysis. Q3.How Can I install and register in LosslessCopy? Step 1:Please copy and paste link below into your browser to download the full installer. Firefox is recommended. Step 3: Then, copy and paste the registration code into it, then click the Register button to go ahead. Meanwhile, please make sure that the Internet connection is fine while you register EaseFab LosslessCopy. Once EaseFab Video Converter is registered successfully, you'll see a pop-up registration successful page. Tips: Please ensure there's no trailing blank when entering your licensed E-mail and registration code..
Q5.What can I do if my EaseFab LosslessCopy fails to update? Step 1: Go to the Menu icon > Help > Update, After that, a Update page will pop up to see if you need to update the program. Step 2: In case above method is not working, you could go to our website to and press Free download. 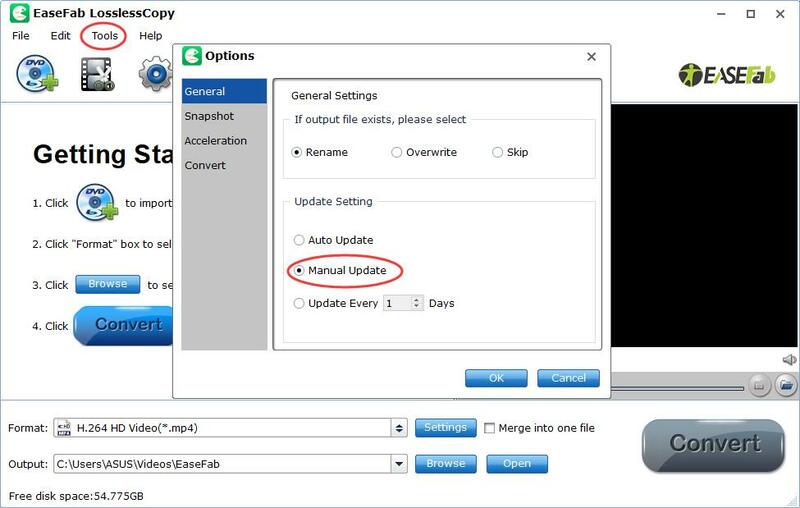 Or you could click the link below to upgrade EaseFab LosslessCopy directly. Q6.I'm using the current version and it performs perfectly and I don't want to upgrade LosslessCopy? Go to "Tools" menu and then click "Options" to open Options window, In "General" tab, tick "Manual Update". Q7.What can I do if the program fails to load a Blu-ray or DVD? 1) If the case happens to all Blu-ray or DVDs, you can follow the steps below to solve the problem. 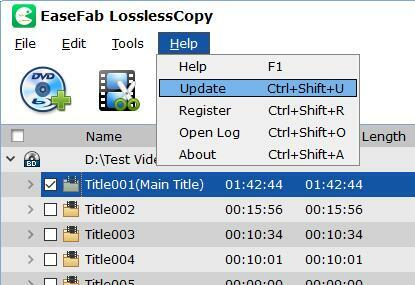 · Make sure you are using the latest version of EaseFab LosslessCopy. · Make sure you have connected a Blu-ray Drive to load the Blu-ray disc or DVD. · Make sure the system read the Blu-ray Drive and Blu-ray disc correctly. · Make sure you have a good network. · Uninstall the program and restart the computer. Then install the program again. · Close the anti-virus program when downloading. When the set up finishes, please right-click the icon on the desk top of your computer, and choose Run as administrator. If your problem still cannot be solved, please contact us ([email protected]) with all files in the log folder for analysis. Here are the ways for you to find files in the log folder. • Move your mouse cursor to the upper-right corner and click "Help" and select "Open Log", it will direct to the installation folder of this program. The log folder is in the installation path. 2) If the case happens to some Blu-ray or DVD discs only, it is maybe the encryption issue. We suggest you contact us with detailed information, including Blu-ray or DVD name, the region code, publisher and Amazon link. Q8.How to speed up the conversion with LosslessCopy? Generally, several factors, including the source file, the output settings, computer performance and configuration, influence the conversion speed. You can follow the steps below to speed up the conversion with DVD Ripper programs. 1. Set the output parameters. After loading the program, please choose the profile from Profile list to set the output parameters on the Settings window lower by clicking the Settings button. However, this will reduce the output quality. 2. Please close other programs before you start the conversion, and you can click Open to find the output file after conversion. 3. 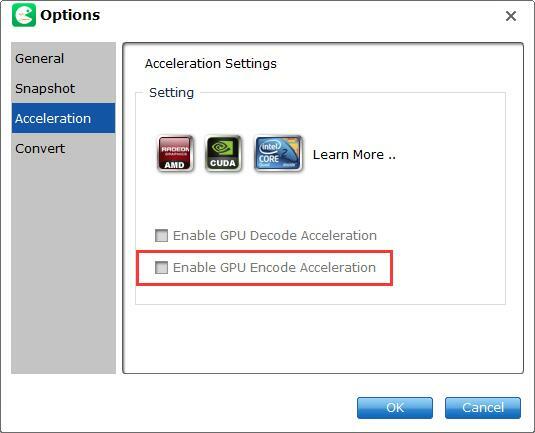 Please click Tools > Options, select Acceleration tab and tick Enable GPU Encode Acceleration. NOTE: Using GPU acceleration technology can help you process Blu-ray or DVD video conversion on GPU (video card) instead of your computer's CPU in order to lessen the burden on CPU. However, you need to have an NVIDIA graphics card, 2nd generation Intel graphics card or AMD graphics card and their latest graphics card drivers on your computer. 4. Use More CPU Core to Convert and Rip Blu-ray/DVD discs. Video manipulation relies heavily on CPU. A high-performance processor can help you convert video faster. For example Intel Core 2 can process 4 data streams at a time and i7 can handle up to 8. In LosslessCopy "Convert", you can use more CPU to computer graphics. 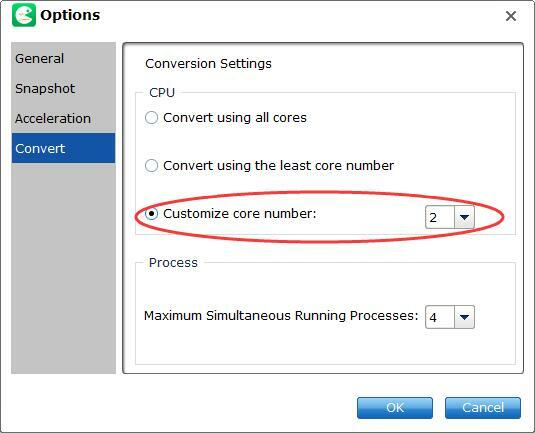 You can set the value of CPU Core Number as all or customize core number to process video conversion. Q9.Can EaseFab LosslessCopy remove region codes from Blu-ray or DVD Discs? Of course Yes! Acting as all-region Blu-ray DVD ripper software, EaseFab LosslessCopy can remove region code restriction upon Blu-ray/DVD discs. In other words, Blu-ray disc of region A/B/C and DVD disc from region 0 to 6 can be easily ripped and converted with EaseFab LosslessCopy. Q10.Does the software preserve chapters' information? Yes. Each title and chapter is preserved in the way they are created into Blu-ray Disc/DVD when you using EaseFab LosslessCopy. Q11.Can I use your program on another PC or Mac? No. One license could only be used on one Windows or Mac PC. If you want to use the program on more than one PC or Mac computer, please contact us at [email protected]. We will provide you a discount on the second registration code. For more questions, you can go to LosslessCopy Help Center to find your answer. If you still can't find your needed question, please contact us to get your answer.